Urgent notice from CTEVT regarding changes in Entrance Examination Center (1 August 2018)Council for Technical Education and Vocational Training (CTEVT) has published a notice regarding change of the entrance examination center for the classified scholarship of TSLC. 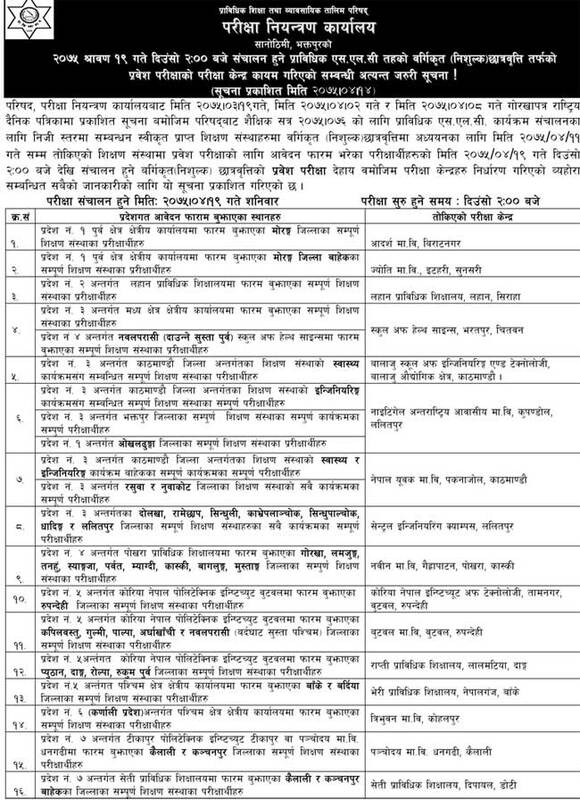 The entrance examination for the scholarship of TSLC is going to be held on Shrawan 19, 2075 (4 August, 2018) . Council for Technical Education and Vocational Training (CTEVT) has published an urgent notice to the associated institution, students and guardians for the change of the entrance examination centers for classified (Full scholarship) scholarship. The Council for Technical Education and Vocational Training (CTEVT) has published the examination centers for TSLC Classified Scholarship Entrance Examination.